There are very few people who would trade a 15-minute commute each morning for a 75-minute bus ride. Even fewer would voluntarily work after-hours every night for their own self-improvement. 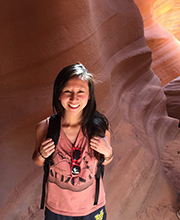 But while most ambitious adults would scoff at such inconveniences, sociology major Amy He, the 2015 Dan and Jean Aldrich Scholarship recipient, was willingly taking them on as a high school student. This dedication to her studies is one of the characteristics that encouraged soc sci faculty members to nominate He for the prestigious scholarship. Awarded to one student at the university per year, the Aldrich award is one of the greatest honors an undergraduate can earn during their career at UCI. Based on a combination of academic excellence, campus involvement, community service and leadership, it recognizes the most well-rounded and driven college juniors in a pool of some of the brightest in the world. And He fits the bill. Her hard work has earned her 20 “A+” grades since arriving at UCI, and she is adamant about making a career for herself helping poor and minority students succeed. But the sociology and education double major is not only intelligent and ambitious, she is incredibly humble and quick to credit others with her successes. And there is no one that she gives more credit to than her mother. He’s relationship with her mother has always been close. Growing up in Visitacion Valley, one of the poorer areas of San Francisco, she was raised solely by her mom, who had emigrated from China a few years before He was born. Without a father in the picture, He’s mother worked tirelessly to support their family of two both financially and emotionally, with virtually no education and in a country where she did not speak the language. He has always admired her mother’s work ethic and strength, especially having grown up hearing stories about the difficulty of her life on a farm in rural China. As the second oldest child, He’s mother had to quit school after the fourth grade to take care of her younger siblings. These stories and her mother’s unwavering support for her were instrumental in encouraging He to pursue academic success. Coupled with her personal desire for the highest quality education, she decided to attend a well-reputed high school in the affluent Pier 39 area of San Francisco—a 75-minute bus ride from the modest home she shared with her mother, aunt, uncle, and cousins. The long commute was well worth it, however. The daily ride took He through all parts of the city—from the wealth of North Beach to the poverty-stricken Visitacion Valley—giving her a clear picture of the wealth disparity in her hometown. Most importantly, experiencing the advantages of attending school in a wealthy neighborhood sparked He’s desire to reform education, so that students like her who grew up in impoverished communities could have access to the same quality education as their financially-sound peers. At her new school, He was introduced to teachers who assisted her with tutoring and allowed her to stay after school to study, since her mother—without an education of her own—couldn’t help her with her homework. It made her realize how, if she didn’t have instructors that were willing to make an extra effort for her or a mother to support her desire to go to a more distinguished school, it would be nearly impossible for her to make it to college. After making it through high school with stellar grades, He toyed with the idea of attending University of California, Davis to remain close to home and her mom. But ultimately she knew that UCI was where she really wanted to be. So, after receiving her acceptance letter and working out financial aid—again thanks to teachers who took the time to alert her to opportunities and explain her options—she made the move south. Since arriving at UCI, He has jumped at countless opportunities to volunteer and get involved, both on and off campus. And though she originally thought she would be pursuing a degree in psychology, she discovered her passion for sociology during her second year and never looked back. The theories surrounding why society is the way it is, stereotypes, and the oppression of certain groups of people fascinate her, and she has been able to use what she learns in class to help her understand the social issues behind poor academic performance in underprivileged youth. She has also taken advantage of opportunities on campus that allow her to study minority groups while having fun and making friends. Her favorite was UCI’s Alternative Break, which she became involved with during her freshman year when she signed up for a trip to a Native American reservation. She found the experience so valuable that she chose to intern for Alternative Break during her sophomore year and plan a one-week service trip to Arizona to learn about immigration policy and another one-week service trip to Los Angeles to learn about homelessness and poverty. Her classes have also helped her learn more about herself and her educational journey. One of her favorite courses has been one on multi-cultural education, which addressed both her personal and academic interests. She was finally able to see her experience from an academic perspective and find out why schooling is so much more difficult for students with backgrounds like hers. Another course that she felt a close connection to was her ethnic and immigrant Americans class. Part of the course examines the learning habits of second-generation immigrants and addresses why they typically work so hard to achieve good grades. The answer was not surprising to He. For He, taking on work and volunteer opportunities in addition to her studies is part of being that successful student who makes her mom proud. She is very active as an event coordinator at her church group, and has interned with on-campus organizations like ASUCI, the Summer Undergraduate Research Opportunities Program the Cross-Cultural Center, International Center, and has served as a new student orientation staffer through Student Life and Leadership. Though school may be getting more challenging, there is no doubt in anyone’s mind that He will make it through her final year the same way she has made it through the other three—with flying colors. And once she has her diploma in hand, there are many different ways that she could go about her goal of improving America’s education system. To begin exploring her options, this summer she is working with Breakthrough San Juan Capistrano—a free program that allows low-income, high-achieving middle and high school students to take part in enriching classes and extracurricular activities. As an intern teacher, He is building lesson plans, teaching pre-algebra and an elective course, and making connections with her students—many of whom will be the first in their families to attend college. “I want to create something for students where they love to learn, where they see the purpose in learning,” she says. In addition, this August she will be traveling to Hong Kong where she hopes to gain insight into the socioeconomic inequality gap in the city through observations and sociological courses taken at the Chinese University of Hong Kong. For He, it will be interesting to compare her first-hand knowledge of wealth disparity in the U.S. to that of a country on the other side of the world. She is especially excited to learn about how government policy affects the distribution of wealth and the quality of life of its citizens. She would like to be able to move to a nicer neighborhood in the San Francisco area, and her number one goal is to provide a comfortable life for her biggest supporter.